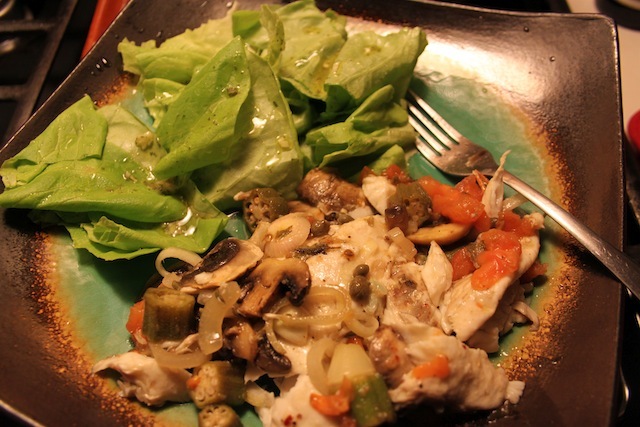 Sometimes We Eat Our Disney Friends: Lemon & Garlic Baked Flounder – Eat Me. Drink Me. 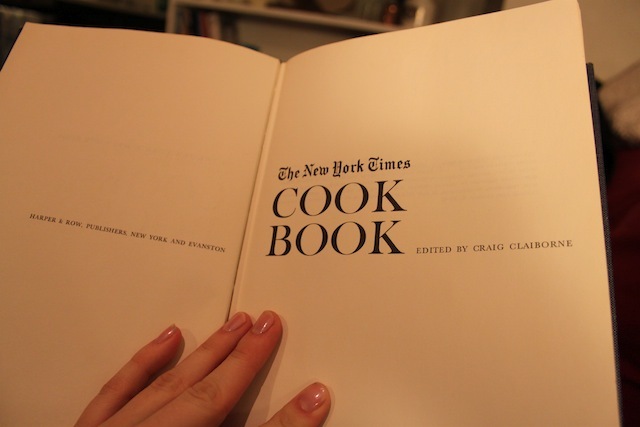 My evening commenced on the couch with a copy of the New York Times Cookbook by Craig Claiborne and the smell of lemon and garlic emanating from the oven. I’ve been craving fish recently and I wouldn’t wonder if I’m overdoing it – snacking on fresh French bread with butter and sardines this afternoon and this flounder for dinner and baccalau soaking in the fridge for tomorrow. It’s just so good. So clean and comforting when outside is so cold and mean. This recipe is incidentally not from the Times cookbook; I made it up out of my own little head. I just feel like cookbook reading and cooking are the perfect components to perfect evenings, and so I mention my couching as a prelude to this delightful fish. Preheat oven to 350°. Rub the flounder with olive oil and season with salt and pepper. Place it in a shallow baking dish. 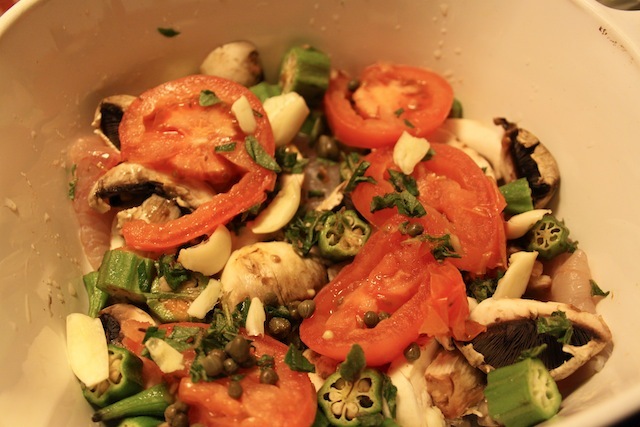 Chop onion, okra, tomato, and mushrooms and add to flounder. Smash garlic with the edge of a blade and add, along with capers and salt, pepper, oregano, and just a dash of red pepper flakes. 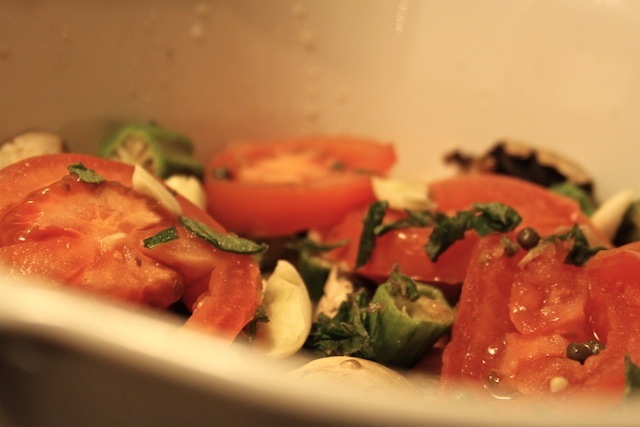 Squeeze the juice of half a lemon (or a whole lemon, if your lemon is stingy) over the vegetables and fish and top with a generous chug of olive oil. Mix as best as you are able, without breaking the fish. Or even better, take the fish out, mix the vegetables and then arrange the fish back in the dish and artfully cover with the vegetables. 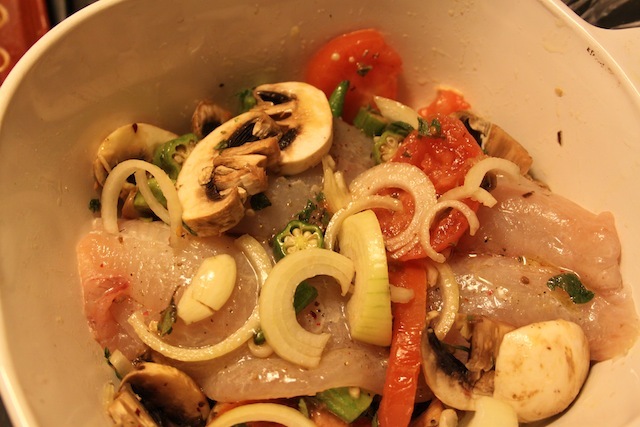 Place dish uncovered in oven and bake approximately 15 – 20 minutes or until fish is done. Or about the time it takes to read the “Appetizers” section in the New York Times Cookbook.